The pleated ruffles and soft, fluid lines of this wedding dress epitomise the romantic designs of Zandra Rhodes. Her signature piece is the fabric, which she has hand-printed with a stylised floral design characteristic of many of her patterns. Zandra Rhodes is renowned for her romantic and lavishly embellished evening clothes. She trained as a textile designer and studied at the Royal College of Art, London, before setting up her own textile printing business. She soon realised that she was the best person to translate her textile designs into fashion and she set up her own business in 1968. In The Observer (9 October 1977) she was described as 'the most original and fearless of British designers, admired for her dedication to doing what she feels'. 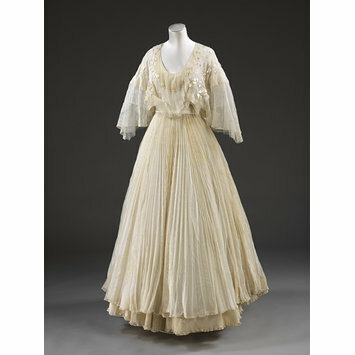 This dress was designed for Elizabeth Florence Weiner to wear for her marriage to David Emanuel in 1976. The Emanuels went on to become influential British couturiers during the late 1970s and 1980s, designing Princess Diana's famous wedding dress. Wedding dress; silk chiffon dress and satin sash with plastic flowers and leaves, net and lace trimmed petticoat, dress cover and hanger, designed by Zandra Rhodes, London, 1976. 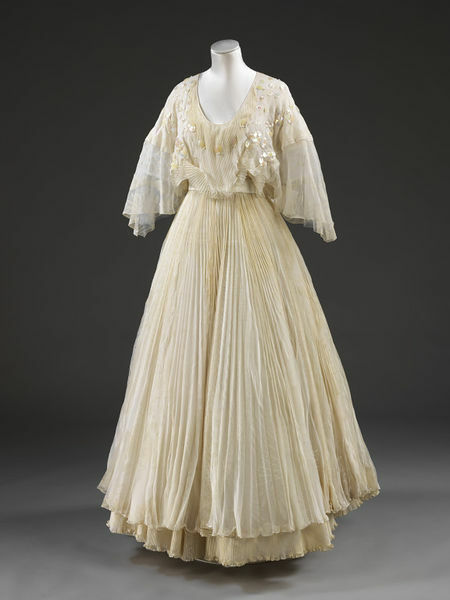 Romantic, feminine wedding dresses were popular in the 1970s. Many were influenced by historical styles, but Zandra Rhodes brought a strikingly modern aesthetic to her wedding dress for fashion student Elizabeth Weiner when she married David Emanuel. Five years later the couple won the coveted commission to design Lady Diana Spencer's wedding dress.